Join us for our Storage Update. Each update covers the latest news, provides technical education, gives our opinion on the latest trends in storage, updates you on the latest briefings we've attended, and, of course, take questions and comments from our audience. We'll cover everything you need to know in 30 minutes but we will leave the line open for an hour to take in questions. 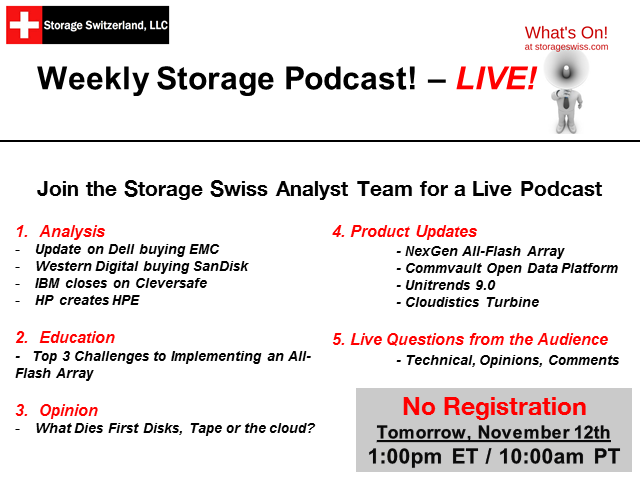 No registration is required, simply tune in to get your 30 minute storage update or hang around for the full hour for the interactive Q&A.